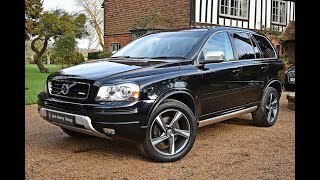 The brand new 2012 Volvo XC90 is a refreshed version of the highly popular Volvo SUV which was released in the year 2002. The tough looking seven-seater SUV was marketed as a stylish, rugged but still a family kind of a car. 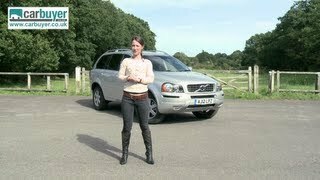 The award winning Sports Utility Vehicle is supposed to be Volvo’s third best-selling car and has been consistently in the top three selling SUVs in the United Kingdom. The 2012 model has undergone some minor body design changes and has a rather contemporary look. Under the hood, the Volvo XC90 has been equipped with a 2.4 liter D5 engine that runs on turbo diesel fuel and can generate a power output of around 200 HP and a maximum torque of 420 N-m for the wheels. The transmission of power from the engine to the wheels is done by a six-speed Geartronic transmission. Performance-wise the XC90 is no slouch and takes 10.3 seconds to go from 0 to 100 kilometers per hour and can clock a top speed of 127 miles per hour. 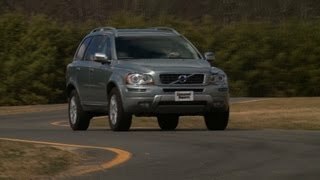 Volvo has also improved the fuel efficiency of the successful SUV by employing advanced technologies. The car has a very impressive mileage of around 34 miles per gallon of fuel and passes all the standards of the Euro 5 emission regulations. The gas emissions are very less about 219 grams of CO2 per kilometer. The most amazing feature of the Volvo XC90 is the Geartronic transmission which has the ability to adjust its shift points to reflect the driver’s style. The SUV also has quite excellent handling due to the 4 wheel drive feature provided with standard Instant Traction technology. The Volvo XC90 will compete for market with other SUVs like Audi Q5 2012 and Mercedes-Benz GLK 500 when it is released into the market. At its launch in 2002, the 'new' Volvo XC90 took the large SUV market by storm, offering a unique blend of non-aggressive, yet rugged, styling and family friendly practicality with a standard seven-seat configuration. Now in its 11th year of production and substantiating its original proposition, the XC90 continues to sell in significant volume, consistently in the top three selling large SUVs in the UK. 2010 was the best selling year of the car with 7,242 cars sold in the UK and in 2011, it still sold nearly 5000 cars and was Volvo's third best selling car, behind the V50 and XC60. In 2011, 42% of cars sold were either SE Lux or Executive Models. From a global perspective, the XC90 also holds the significant position in Sweden's overall economy, being the country's most valuable export. Its total yearly export value was over 40 billion SEK (3.8 billion GBP at the current exchange rate) in the peak years. It has also received over 110 awards around the globe. For 2012, the Volvo XC90 has undergone a refresh, keeping it looking contemporary and up-to-date within the competitive SUV market. In terms of the non-aggressive styling, the Volvo XC90 has a subtle front end, a gently sloping split tailgate and a shorter roof section to convey a smoother, un-intimidating profile and help the vehicle to look more compact than its dimensions suggest. This has meant that many more female customers have felt comfortable driving the XC90 than a number of competitors' large 4x4s. The chassis in the Volvo XC90 is designed to give the vehicle the same ride and roadholding characteristics as a passenger car. The suspension is, however, more substantial to handle heavier loads, the higher ground clearance and all-terrain possibilities, along with being fitted with Volvo's self-levelling suspension as standard. For 2012, Volvo have further refined both the exterior and interior of its XC90 premium SUV. The new refinements to this still class-leading SUV include more sophisticated lines and materials to give an even more rewarding driving experience. blend of sophisticated elegance and capable ruggedness," says Peter Mertens, Senior Vice President, Research and Development at Volvo Car Corporation. Available to order now, the new XC90 can be specified in ES, SE, SE Lux, Executive and R-Design guise. Available with the characterful D5 engine and automatic transmission, prices start at £35,175 for the D5 AWD ES Geartronic through to the Executive model starting at £43,775 on the road. The exclusive Executive version has a number of features that further elevate its level of cosseting luxury while the R-Design version boosts the XC90's sporty aura and gives the car a more driver-focused character, including amongst other features, unique 19" alloy wheels and an upgraded sports chassis. The XC90 is designed to give an elegant, muscular and robust impression, which has been reinforced through a number of refined details. A new day running light configuration using LEDs in the lower bumper gives the front more character. Thesilver metallic bumper bar as well as silver roof rails are now standard on all variants. There is also a new lower door moulding and all XC90 models are now fully colour-coordinated. In common with the latest generation of S60, V60 and XC60 model, the new tail lamps have dual light guides, LED brake lights and a silver turn indicator bulb (still with orange light). The update also includes a new six-spoke 18-inch alloy wheel in a silver matt finish and a new diamond cut 19-inch alloy wheel available on the R-Design. The passenger compartment is very spacious and features an uncluttered design. The seating position gives the driver a commanding view over the traffic and the passengers a comfortable seating position. A number of refinements have been made to give the XC90 interior an even more luxurious feel, including the new three-spoke steering wheel, aluminium décor as standard and the watch dial-inspired instrument design with white lighting. The tailgate, which is divided into an upper and a lower section, now comes with a new, colour-coordinated leather grab handle. The load cover has also been redesigned. The R-Design version also features redesigned upholstery with new contrast stitching and colour combinations, inlays and door panels. Bluetooth music streaming via the Bluetooth mobile phone connection and Volvo's smart mobile phone application using the On Call system becomes available as an option. The interior benefits from a seven-seat configuration as standard, resulting in 64 possible seating layouts. The middle seat in the centre row has an integrated child booster cushion and also slides forwards independently so it can be positioned further forwards towards the front seats, thus improving contact between a child and the front seat occupants. What's more, the armrest between the front seats is removable to create more leg room for the passenger in this centre seat. The third row features two separate seats, offering full comfort for children or for adults of modest build. Unlike some rivals, these do not take up valuable space or have to be clumsily removed, but instead they can be neatly and simply folded away individually out of sight into the boot floor when not in use. Both the second and third rows of seats can be folded down to create an entirely flat luggage compartment floor and in addition, the front passenger seat also folds forwards to accommodate extra-long loads. The interior of the Volvo XC90 complies with a strict industry standard called Oeko-Tex, which sets maximum levels for dangerous substances contained in textiles and trim materials. All the leather upholstery and trim fitted to the Volvo XC90 meets strict Oeko-Tex standards. Furthermore, the leather is tanned using natural plant substances and the components on the Volvo XC90 that most frequently come into contact with the skin - the door handles, ignition key and safety belt locks - are also compliant with Oeko-Tex and are allergen-free. The XC90 is built as a passenger car with a unitary body. The chassis, with spring struts at the front and multi-link axle at the rear, are tuned for a stable, controlled drive and alert steering response. The multilink rear axle is an independent rear suspension system and it is designed to offer a good balance of controlled wheel movements and high ride comfort. A long wheelbase and wide track, together with a very torsionally rigid body, contribute to the predictable, controlled driving manners. In its latest incarnation, the D5 engine fitted to the XC90 now boasts 200hp with a maximum torque figure of 420 Nm. It conforms to the Euro 5 emission regulations and offers fuel economy of 34.0mpg on the combined cycle and emits 219g/km of CO2. The 2.4 litre turbo diesel D5 offers both strong mid-range urge and refinement. It is fitted with Volvo's six-speed Geartronic transmission as standard and will accelerate from 0-62 miles per hour in 10.3 seconds and will go onto a top speed of 127 mph. Volvo's Geartronic transmission offers the driver the best of both worlds. The transmission automatically adjusts its shift points to reflect the driver's style. It also offers a manual, sequential-shift facility where the driver is able to choose gears individually by tipping the lever forwards to change up and backwards to change down. The Volvo XC90 features AWD (All Wheel Drive) with Instant TractionTM as standard. With an electronic Haldex coupling system to maximise traction between the front and rear axles, yet despite its substantial off-road abilities, it is as easy, responsive and rewarding to drive as any regular Volvo saloon or estate model. Roll Stability Control (RSC) is an active system that intervenes in situations when the car senses that there is a risk of rolling over. This function helps stabilise the car and reduces the risk of rolling over in an accident. If a rollover accident should still occur, the Roll-Over Protection System (ROPS) helps protect the passengers. A network of beams in the body structure helps distribute and absorb the resulting forces. In addition, an electronic sensor registers if the car is about to roll over and accordingly activates the seat belt pre-tensioners and the Inflatable Curtains. The Volvo On Call system can now be combined with the Bluetooth mobile phone service. The Bluetooth connection has been upgraded to allow not only hands -free phone conversations but also music streaming. New for Model Year 12 XC90s, and available in all of Volvo's models, is a mobile application that makes sure that the driver can stay in touch with the parked car via an iPhone or Android smart phone. The mobile application is an extension of the Volvo On Call system. The mobile app is free and downloaded via the iPhone and Android application stores. The app is designed to offer the owner an intuitive, easy-to-use relationship with the car from a distance. Car locator. The location of the car is shown on a map, enabling the driver to find the way to it when parked in an unfamiliar area. There is also a digital compass that points the driver in the right direction. Vehicle dashboard. This feature gives the driver access to a wide range of information: fuel level, remaining range to empty tank, average fuel consumption, average speed, odometer reading and trip meter reading. Car check. The mobile app performs a "health" check of the car, displaying information about bulbs, brake fluid level, coolant level, engine oil level and engine oil pressure. The Volvo XC90 is a modern SUV, built like a passenger car with highly efficient deformation zones, a low centre of gravity and advanced systems to help minimise the risk of personal injuries, irrespective of the situation and accident type. For added protection, Volvo has also reinforced the XC90's roof structure and B pillars with extremely tough Boron steel, which is five times stronger than normal steel. The body structure has the task of distributing and absorbing incoming collision forces so that the passenger compartment remains as intact and undamaged as possible. An extra lower cross-member, concealed behind the front bumper, helps reduce the risk of injury to other road users, in case of impact, by reducing the risk of the XC90 riding up above the other vehicle's body and by activating their safety systems and crumple zones. The engine is deliberately mounted as low as possible in order that the distance between the top of the engine and bonnet is at least 80mm to allow for deformation to absorb the impact, thus reducing the risk of head injuries to pedestrians. Volvo Cars developed a number of in-house functionality and driver support systems, such as WHIPS (Whiplash Protection System), SIPS (Side Impact Protection System) and IC (Inflatable Curtain). All are fitted as standard in all of Volvo's models, but have undergone further development specifically for the XC90 model. For instance, the Inflatable Curtain has been extended so that it also covers passengers in the third row of seats and has been designed to stay inflated longer in case of multiple roll-overs, and to help keep occupants inside the vehicle. All seven seats are equipped with three-point inertia-reel seat belts, belt pre-tensioners and head restraints. The Volvo XC90 was introduced at the Detroit Auto Show in January 2002 after its initial concept was first shown at the same show in 1997 under the guise of the Adventure Concept Car. In 2005, global annual XC90 sales peaked at 86,000 vehicles, making it Sweden's most valuable export product. In total, to date, over half a million cars have been built. "The XC90 was the first of the next-generation SUVs. Its blend of SUV roominess, true passenger-car qualities and groundbreaking safety features made it an instant success in a segment that at that time was tainted by several issues," says Stefan Jacoby, President and CEO of Volvo Car Corporation. The SUV segment was booming at the start of the new millennium. The rugged look, spaciousness and high seating position made this type of vehicle a favourite with many customers. However, the early SUV's driving properties also contributed to making them over-represented in rollover accident statistics. Project Director Hans Wikman and his team were determined to solve all these issues when the XC90 was signed off by Volvo Car Corporation President Tuve Johannesson at the Arizona Proving Ground in May 1999. Recalling his feelings when the management team inspected the three design alternatives, Hans Wikman recalls: "We in the project team were a bit tense. The SUV programme had been canned twice before. We kept our fingers crossed that our favourite design was so good that the executives would approve it without hesitation. And that's exactly what happened." "The model we showed to the management was almost identical to the production XC90 we revealed in Detroit. We had done our homework well, thanks to our female reference group. A majority of SUVs were driven by women and "our" ladies gave us great input," says Doug Frasher. The multi-background reference group, including Swedish Hollywood actress Maud Adams, inspired the shape of the XC90 by asking for masculinity instead of the subtly-different but traditional "macho" look of most SUV's. Doug Frasher recalls, "I remember one of the ladies making a sweeping gesture that almost sketched the sleek shape of the bonnet flowing up on the A-pillar. We put a lot of effort into creating a design that felt strong and protective without the impression of sheer size. The XC90 is muscular, but not aggressive." The XC90 project team managed to fit seven seats into a vehicle that is no longer than 480 centimetres (15.7 feet) - an achievement that is, 11 years on, still unrivalled in the segment. Seatbelts with "pre-tensioners" for all seats. A reinforced roof structure, seat belt pre-tensioners and inflatable side curtains helped create superb rollover protection for all seven occupants. 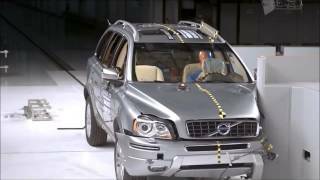 This world-class safety level was demonstrated when Volvo Car Corporation invited the world press to watch a violent rollover test with the XC90 outside the state-of-the-art Safety Centre in Gothenburg, Sweden. The video from the 2002 event, still available on YouTube, shows how the XC90 rolls over three times before ending up on its right side. Volvo Car Corporation's original target for the XC90 was 50,000 units per year worldwide. However, the model became so popular that the figures grew rapidly until they peaked at 86,000 units in 2005. The United States has been the largest single market for the XC90, with 2004 (38,800 units) and 2005 (36,200 units) being the peak years.